Are cryptocurrencies actually currency? Are Bitcoins money? Are cryptocurrencies as trustworthy as standard forms of payment? Cryptocurrencies are a current topic and raise these and many other questions. These are issues being explored in-depth at FH JOANNEUM. The term Bitcoin was first used in a paper written in 2008. It remains unclear which person or group of people was responsible for this paper and therefore for the best-known cryptocurrency at present. In 2009, Bitcoins were implemented and published as an open-source software: the first block generated consisted of 50 Bitcoins. Today there are some 17 million Bitcoins with a value of over 150 billion dollars. The difference between cryptocurrencies and conventional money? The same notes or coins cannot be spent twice and it is difficult to produce duplicates. Money is regulated by the banks and every note has a serial number. Online, things are different: data can theoretically be copied, duplicated as often as you like and ‘spent’ several times. There are no serial numbers and banking regulations can be bypassed online. So what are the equivalents in e-money and cryptocurrency? The transfer of Bitcoins takes place, figuratively speaking, through private and public keys and digital signature processes. The digital signature of the sender can be seen as a declaration of intent for transfer. Once the declaration of intent has been confirmed by the collective of participants, the transfer is inserted as a block into the blockchain and the ownership status is adjusted irreversibly. Hash values and the proof-of-work concept play a key role in the blockchain which requires some highly elaborate calculations. These calculations can only be carried out within the collective of all participants and requires vast processing power. This prevents any individuals from changing or manipulating the blockchain. The strength of Bitcoins: the system and its cryptographic protocols have been operating smoothly for close to 10 years. To date, there have not been any significant problems caused by a flawed implementation of protocols. But Bitcoin does have a few weaknesses. The amount of energy consumed over one year for the calculation of hash values to secure Bitcoin transactions in the blockchain is equivalent to that used across the whole of Switzerland. Bitcoins are also less suitable for everyday use because the validation processes are lengthy, the number of transactions per second limited and the value of Bitcoins extremely volatile. And another drawback: incorrect ‘transfers’ cannot be reversed. There are now over 1,500 successor cryptocurrencies, all striving to be a better alternative. Only time will tell whether specific cryptocurrencies will succeed in the long-term and how blockchain technology can be applied to other areas too – the keyword here is ‘smart contracting’. Bitcoins are also used for speculative trading. They do not have any value in themselves but rather gain value when people are prepared to buy Bitcoins for ‘real money’. And there are always new Bitcoins. The method of generating Bitcoins is known as mining. Each participant only needs to find one hash value for securing a block of the blockchain in order to be rewarded with new Bitcoins. The difficulty of finding a hash value is constantly being adapted in the Bitcoin network so that a correct hash value is found every 10 minutes, statistically speaking. Competing and highly specialised computing centres around the world are constantly seeking out corresponding hash values. The first one with the correct solution wins and receives Bitcoins as a reward. Since having a higher processing power boosts the chances of winning, these computing centres are constantly being expanded, which results in an increasing and unbelievable level of energy consumption. The real estate bubble, Dotcom bubble, Bitcoin bubble: a so-called bubble can emerge when demand is increasing faster than production. And a speculative bubble and system collapse is certainly possible with Bitcoins too. At present, cryptocurrencies are being integrated within the scope of money laundering regulations at a European level. This marks a first step towards regulating cryptocurrencies. Anyone wishing to gain a better understanding of the technical side of cryptocurrencies can gain knowledge about blockchain, hash values and cryptography as part of the Master’s courses in Electronics and Computer Engineering and the IT courses offered by the Department of Applied Computer Sciences at FH JOANNEUM. The financial sector is covered by the Master’s in Banking and Insurance Management – graduates in business administration and law can develop their knowledge in this course. 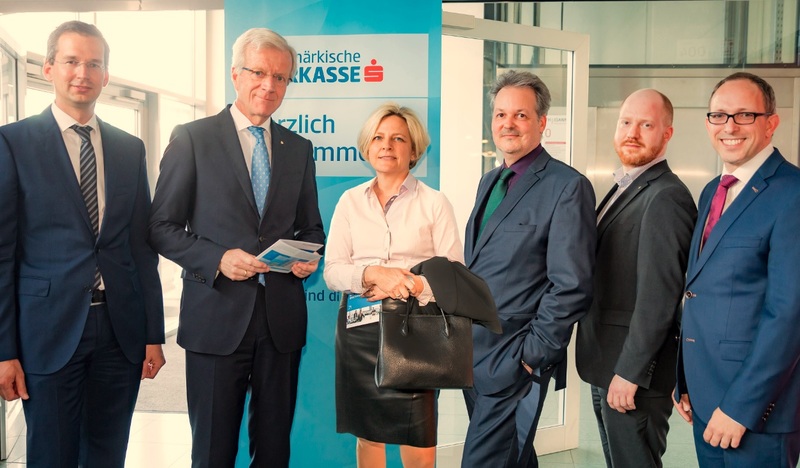 The technical and legal aspects of cryptocurrencies were addressed at FH JOANNEUM as part of a dialogue series in cooperation with Steiermärkische Sparkasse. “FH JOANNEUM is defined by its practical content. The Practice Dialogs give experts the platform to address the latest topics. We are very pleased that they are willing to pass their knowledge on to those with an interest in the subject on a regular basis,” says Werner Hauser, Coordinator for Legal Matters at FH JOANNEUM.